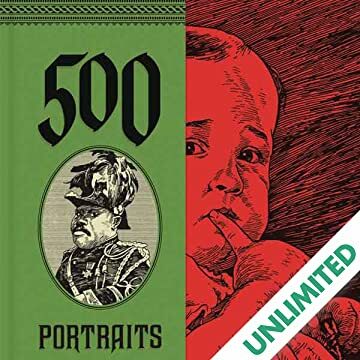 500 Portraits collects for the first time over two decades of portrait work by the beloved and award-winning creator of Drinky Crow's Maakies, Sock Monkey and Billy Hazelnuts. 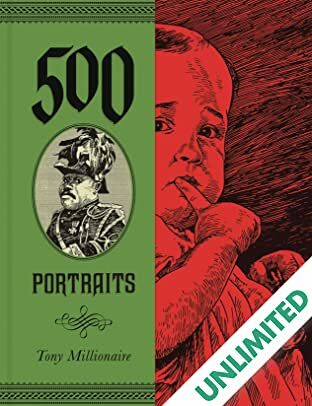 Tony Millionaire's gorgeous fountain pen illustrations, which mingle naturalistic detail with strong doses of the fanciful and grotesque, include the famous (Bob Dylan), the infamous (Abu Ghraib soldier/model Lynndie England), the fictional (Yoda), the animal kingdom (a cockroach), and everything in between. Literary figures (Hemingway), literary characters (Don Quixote and Sancho Panza), Hollywood legends (Steven Spielberg), comics icons (Hergé) and historical figures (Hitler) also figure prominently.